Zest is the skin or rind of citrus fruits (lemons, limes, oranges, grapefruits, kumquats). If you’veever tasted an orange peel you know it’s bitter at best. The thin layer of colored skin provides concentrated citrus flavor to food. The bitterness comes from the pith, the thick, white layer underneath. 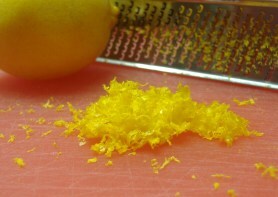 You can remove zest with a zester, a small handheld tool that removes thin strips of zest whenpulled across the outside of the fruit, a microplane (the long silver tool in the picture) or a regular grater. Grate gently so you’re only getting zest,not pith. Turn the fruit and grate in a new spot when you see thewhite pith. Don’t pack zest tightly in your measuring spoons or you may end up with more citrus flavor than you need. If you’re using a microplane or grater, check the back or non-cutting surface to remove any zest that sticks.